RELATIONSHIP BETWEEN INFLAMMATORY PERI-IMPLANT DISEASE AND THE ACTIVITY OF PERIODONTAL DISEASE. George S. Manev , Christina Popova. Department of Periodontology, Faculty of Dental Medicine, Medical University, Sofia, Bulgaria. Clinical application of knowledge about risk factors and indicators associated with the loss of implants or peri-implantitis requires additional studies to demonstrate the risk of peri-implant diseases. Identification of risk factors for peri-implant mucositis and peri-implantitis will provide the clinician tools for determining the prognosis of the individual and the implant and better selection of patients for placement of implants. Progress in understanding the risk of peri-implantitis at the individual level with a careful assessment of the risk level of an implant would be useful in the planning of implant treatment. The similarity in the etiology and pathogenesis of periodontal diseases and peri-implant infections requires an assessment of periodontal status and assessing the risk of progression of periodontitis in patients with a history of periodontal disease and implants. In the literature are few and conflicting data on the relationship of periodontal status of the patient and peri-implant diseases. It is likely that the presence of periodontal pockets, showing clinical signs of an infection and activity to be associated with inflammatory peri-implant diseases. The study is focused on the discovery of a relationship between peri-implant mucositis and peri-implantitis and activity (bleeding on probing - BoP) of patient’s periodontal disease. Statistically significant relationship was established between occurrence of active periodontal sites and inflammatory peri-implant diseases. Key words: peri-implant disease, periodontal disease activity, bleeding on probing. Manev GS, Popova Chr. 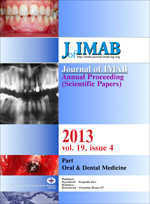 RELATIONSHIP BETWEEN INFLAMMATORY PERI-IMPLANT DISEASE AND THE ACTIVITY OF PERIODONTAL DISEASE. J of IMAB. 2013; 19(4):345-347. doi: 10.5272/jimab.2013194.345. 8. Papapanou PN. Epidemiology and natural history of periodontal disease. In: Lang NP, Karring T, ed. Proceedings of the First European Workshop on Periodontology, London: Quintessence; 1994.